Paige is a very sweet little girl, she loves to sit next to her human, but she isn’t very affectionate, she just lays there and enjoys being rubbed on. She gets along with the other dogs, but she would be great as a one owner dog. She is housetrained, but due to some knee problems she needs a house with no stairs. She is crate trained, but also enjoys sleeping with humans. 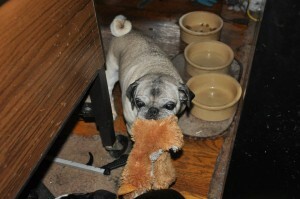 She does play with toys, they say she is probably 11 years old, but she acts much younger when she plays. Hi! Just saw that this little lovely pug was up for adoption. Looking at Daisy also. Thanks!